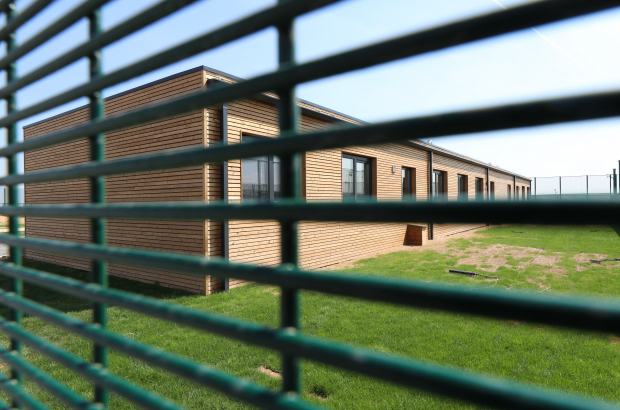 The Serbian family being kept at the new secured facility for families in Steenokkerzeel has been moved, following weeks of controversy about their health and wellbeing. The woman and her four children are now in an open facility in Sint-Gillis-Waas, East Flanders. Human rights groups as well as the EU had expressed concerns this summer about the new detention facility for families in Steenokkerzeel. Europe’s Commissioner for Human Rights contacted Belgian migration secretary Theo Francken earlier this summer about locking up children based on their parents’ immigration status. Protests at the Steenokkerzeel centre – where an Azerbaijan family of six is still staying – have taken place, amid visits by health-care workers. A psychologist recently told the press that the four Serbian children, aged one to six, were suffering psychologically from being in a locked facility. There is a 28-day maximum stay in the family detention units, called 127bis (pictured above), and so the Serbian family has now been moved to the open facility. Francken has said that the family’s request for asylum was turned down years ago and that they fled from open facilities previously. The family is awaiting a decision on a new request for asylum made in the name of one of the children. Francken, meanwhile, has asked for an amendment to the law to prevent “the maximum confinement period being interrupted by all kinds of new and useless procedures”. Francken has also developed a number of new measures regarding transmigrants, together with federal interior minister Jan Jambon. While migrants passing through Belgium to reach the UK are sleeping rough in Brussels’ parks and train stations, there have also been two recent road deaths between Ghent and the coast when people tried to cross the E40 to reach lorries in parking facilities. The new package of measures includes a transmigrant administration centre at the Steenokkerzeel detention centre. Currently local police are tasked with taking transmigrants into custody. Now they will be brought the detention centre, where their identification can be established, fingerprints taken and background checks carried out. Transmigrants can then wait at the centre for decisions made by the immigration office. It is also hoped that the transmigrant centre will help to uncover and break up human trafficking rings. Until the centre is ready, capacity for transmigrants will be more than doubled in detention centres, from the current 70 places to 160. And police stops will be increased in transmigrant routes in Belgium. Other measures in the package include breaking up the camps in Maximilien Park, where, according to Francken, human traffickers are at work; detaining and ultimately prosecuting human traffickers; and extra security in Zeebrugge port. In related news, the Brussels chapter of Doctors of the World reports having “hundreds” of testimonies from migrants regarding abuse at the hand of police. The group received the testimonies spontaneously, it told L’Avenir, while it was deliver health-care services in the park. Aside from violence, migrants say they have had objects and money stolen by police. One foster family hosting a migrant, services that are arranged by the Citizen’s Platform for Refugee Support, has actually filed a complaint with police watchdog agency Committee P alleging that police stole €1,000 from him. “This is of course not the case everywhere,” said a Doctors of the World spokesperson. “It is perhaps carried out by a small number of officers whose actions are exacerbated by events.” The organisation wants to bring the situation to the attention of federal authorities, it said, as “these are not isolated events”.